Hyrule Warriors Legends isn't far away, which is big news for fans of the Wii U title that fancy some extra content and combat on the go. Koei Tecmo's currently in the process of promoting the title heavily for its upcoming Japanese release, too, which gives us all an early look at how it's shaping up. This isn't the first showcase video of recent times, but is particularly interesting as it gives us a look at Linkle's campaign. The new character will have her own sub-story that'll tie into the overall campaign - perhaps rather like some of the Wii U DLC did - and the new video shows its opening segments. It looks like a natural extension, and it's worth remembering that the 3DS version will also include all of the extras that were released separately as paid-DLC on Wii U. Any word yet on how everything is being ported to the Wii U version? Free, paid, DLC package, update patch, need the 3DS version? Too bad My Nintendo isn't up and running so Nintendo could just see if we own both versions or not. Soon I suppose. So i do own a New 3ds XL and haven't played the Wii U version (skipping this gens Nintendo home console due it's lack of success/content), is the game fun? Is the Wii U version entertaining? I would be happy to have a game that take advantage of my new 3ds, the 3ds version looks good... but.. it looks so easy, I mean, the foes doesn't do any harm to your character, judging from the videos I've been watching. The game just seems to be hack and slashing and way too easy. What's the fun about it? Another question; Is it only a single player experience or will the 3ds version involve online multiplayer aswell? They better bring all this new content to the Wii U version, otherwise many people will feel VERY ripped-off, myself included. We don't need to see any more trailers for this game, I think they've gone overkill on the trailers. Please make it happen Nintendo! @Konda Well I never played any of the Dynasty Warriors games and had a lot of the same concerns, but I bought the Wii U version and loved it. Killing any one enemy is never really a challenge except for the bosses. You're basically trying to prevent enemies from overwhelming the map. The Adventure Mode gives you different objectives and there's definitely a lot of difficulty as it progresses. Any game can be repetitive so it just comes down to whether you enjoy playing it or not. Wii U has been unsuccessful, but it does not have a lack of content in the slightest. Currently has more decent games than the PS4 and XboxOne combined. Ok thx, I will have to consider it more before deciding, I will wait for player opinions and reviews aswell. Speaking of that many games are repititive. MH4U I did enjoy a lot because it's challenging and rewarding both. Does Hyrule warriors atleast reward you somehow, that motivates you in some kind of way to want you to proceed with the game? The content the Wii U offers is much the same from the Wii formula, sequels of already existing franschises which the Wii offers aswell, not much was new and exciting, the only games that woul interest me are Xenoblade X, Super Mario Maker and the Donkey Kong game. Although the Wii offers so much more than the Wii U, and since then I'm just fine just with a Wii as a Nintendo home console untill the time Nintendo decides to think of something new to attract its older consumerbase. Pretty much everything on competing systems is sequels and remasters as well. Is this going to be released on Wii U as a legends DLC pack? I have my money ready, I just cannot handle handheld gaming anymore for any sessions longer than about 10 or 15 minutes. @rjejr This is why there needs to be a Nintendo Direct either this week or next week. Hyrule Warriors Legends releases in 10 days in Japan and knowledge about the transfer is pretty limited. Still waiting for this to become DLC for the WiiU version. I'm still on the fence. I own the Wii U one, but I play my N3DS more. (not recently. Xenoblade X!!) If it's just a few add ons, I'm going to wait until I'm in a drought. I have to see, but I am excited about it. I love Hyrule Warriors. I also love the tune characters a lot. 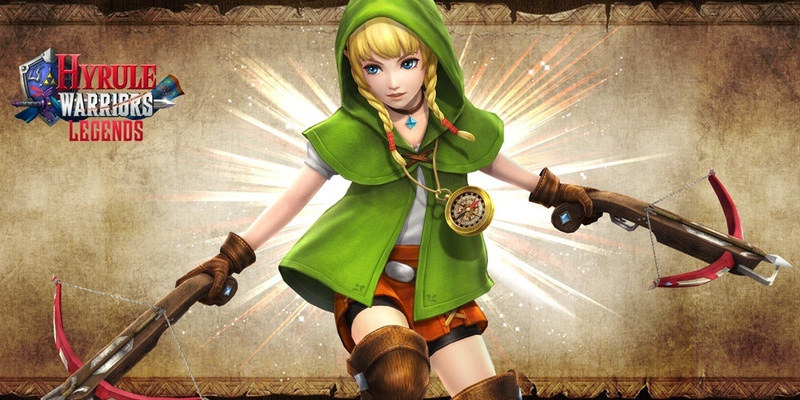 Linkle kinda makes me want to tinkle. I'm really looking forward to this. I just wish I knew if it the transfer of the characters would work between a JP version to a NA Wii U but I'm guessing it wouldn't. I'm really tempted to import this just because they're are other games that haven't made it out of Japan too. Mainly Power Drift and Final Fantasy 3DS. Even though DQVIII is coming this summer, it would still make for a great import. @evosteevo No, both games and DLC are completely region locked. @Grumblevolcano Next ND better be all about the NX. OK, no, I take that back. We need an ND for TP HD, I think they need to show off how the Gamepad will be used more, and why people who played either the Wii or Gmaecube versions should fork over anther $50. Heck the Wii version plays on the Wii U already. And they need some more SFZ to build hype and excitement after the delay. And Pokken tournament, I'm hoping for some type of story mode, not a simply fighter like SSB. So yeah, we coudl use another ND soon to give Wii U it's last hurrah, end it w/ a name for Zelda U, preferably not Zelda NX, but one more Wii U ND, then after TP HD, SFZ and Pokken release, then unveil NX hardware, then the software at E3. And if Pokken doens't use the Gamepad too much - off tv play doesn't count - then port that to NX as well. And stick the west launch date for My Nintnedo/Nintendo Account in there somewhere as well. 3DS can have it's own ND a month later. For the HWL 3DS to Wii U DLC I just need a simple statement how and when to get it, and how much. But I suppose since they need an ND anyway they could cover HWL as well. Looking forward too this game. I hope all the new content comes on HD format also some time later on Wii U.